It comes in all shapes and sizes. It’s hidden in small incidents that trigger flashbacks. It grabs hold of you and doesn’t seem to want to let go. 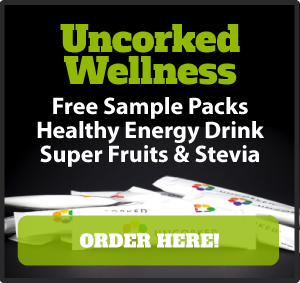 It stymies any healthy living journey. It’s the main tool Satan uses to take you out of the game of life. It’s called fear. I know all about fear. The evil one used it to keep me in line, headed on the path to total destruction. At 430 pounds that’s exactly where I was destined. I could lose weight pretty easily. The problem was I would put it back on plus more. I’m an educated person with a bachelor’s and a master’s degree. I felt I should have been able to figure out how to do this. Try as I might, I couldn’t get a handle on it. Fear gripped me when I passed the 300-pound mark. After losing 100 pounds, I once again celebrated with Mamaw’s oatmeal cake and put back on the weight plus about 25 more pounds. It was the proverbial straw that broke the camel’s back, meaning it was the last action in a long line of cumulative actions. I wanted to break this lose-gain roller coaster because I was afraid of the results of gaining even more weight. It was this fear that drove me to decide to do “nothing”. Everything I did seemed to backfire on me, so I decided doing nothing was better than failing. With this definition I continued to gain weight. Fear is just false evidence appearing real. The evil one is good at making us believe the “evidence” is a solid reason to just give up and surrender to the fear. I didn’t have a fear of gaining weight because in some way I felt the weight protected me from men like the one who molested me when I was 11. For years I muddled through until my fears seemed to come true. What we dwell on, think about and turn over and over in our minds will come true whether that be fears or dreams. It’s just one of the reasons we should guard our thoughts. 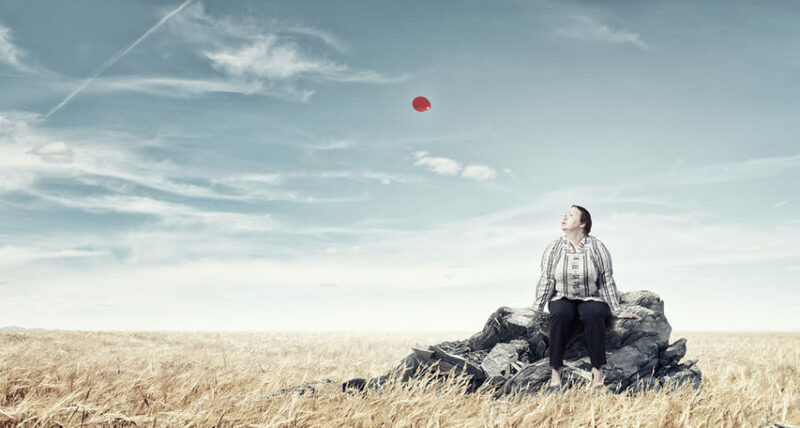 When I reached 430 pounds and had to be hospitalized with congestive heart failure, a rude cardiac surgeon told me that I needed to lose at least 100 pounds and keep it off or I’d be dead in five years. This jump-started my desire to find a solution. 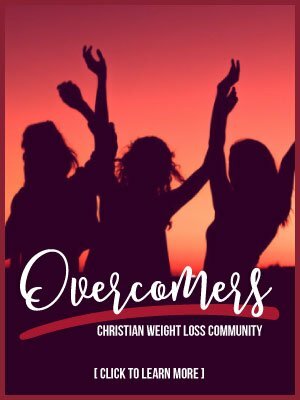 You can read all about how I began to be a loser in Sweet Grace: How I Lost 250 Pounds. Suffice it to say, I had to take a risky step of faith. I had to overcome my fear of doing the wrong thing. For years I wouldn’t even weigh when I went to the doctor’s office. I didn’t have a scale at home that went high enough to weigh me plus I just didn’t want to know the truth. I will admit that I was even afraid of the scale. I wanted to smash it to smithereens because surely it was against me. Getting over that fear was one of the first steps. I began to see the scale as a tool to help me determine if how I was eating and moving was helping me or not. If the scale showed a weight gain that said to me that I needed to adjust something. If it showed a loss, I noted what I had done differently the day before or the day before that. I didn’t let it intimidate me or rule my life. It’s nothing more than a piece of machinery which gives me information I can use to help me on my journey. I joined a weight loss group called “Just do it”. Following this motto helped break my “do-nothing-and-no-harm-will-come-to-me” philosophy. I began doing something about my problem, taking small steps towards my goal. I learned to take steps that would change my habits for good. 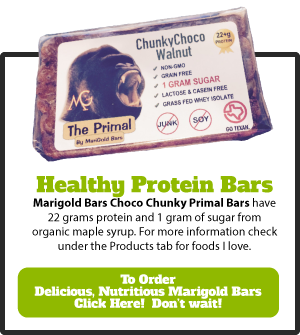 I changed my mindset from dieting to creating lasting lifestyle changes. Each thing I incorporated I realized this is for the rest of my life, not just until I get to a goal weight. I’m cooperating with God to transform my entire life—body, soul and spirit. 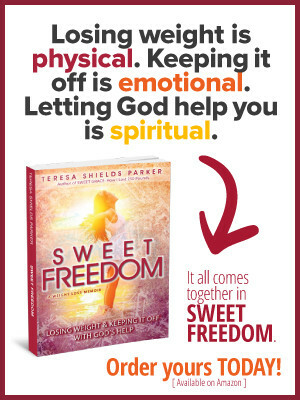 Fear began to shatter when I came out of my self-imposed exile and submitted totally to God in this process. I realized God only directs moving targets. Sitting and trying to decide what to do doesn’t work. I have to be trying things, throwing out what doesn’t work and keeping what does. When I do that, God is right beside me telling me, “No, this is the way, walk here.”3 He directs me when I stray off His path. When I’m listening for His still, small voice, I will never go wrong and if I do, I get right back on the path He has for me. Yes, the evil one will try to convince me I need to do nothing again, but it’s difficult for him to do when I’m moving forward. Forward motion dispels fear every time. Forward motion delights God to no end. Forward motion is the only way God can direct us on this path. What is one step you can take today to move you forward? 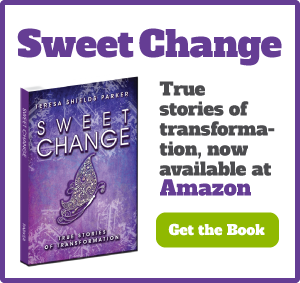 Teresa Shields Parker’s weight loss memoirs are part of the Sweet Series on Amazon. 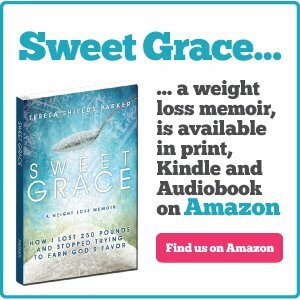 Her first book, Sweet Grace: How I Lost 250 Pounds and Stopped Trying to Earn God’s Favor is still #1 in the Christian Weight Loss Memoir Category. 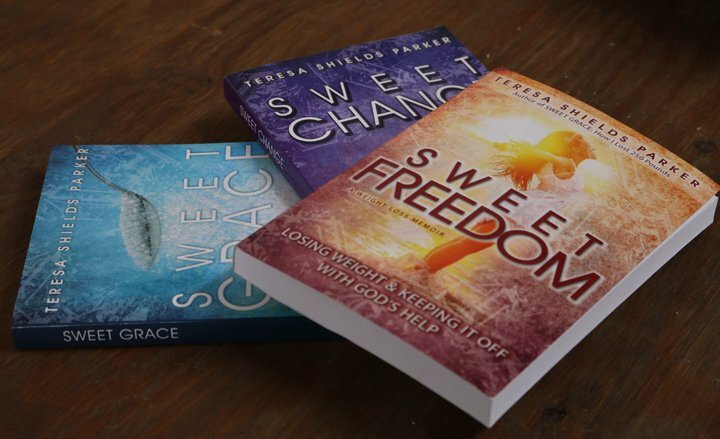 Also in the series is Sweet Change: True Stories of Transformation, Sweet Freedom: Losing Weight and Keeping It Off With God’s Help, Sweet Grace Study Guide and Sweet Freedom Study Guide. Get your copies now. All are available in print. Several available in kindle and audible. The links take you to the Amazon pages. Sweet Grace for your journey.